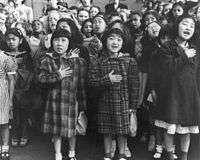 The Pledge of Allegiance in the United States is one of the most overt forms of banal nationalism – most are less obvious. Banal nationalism refers to the everyday representations of the nation which build a shared sense of national belonging amongst humans. The term is derived from Michael Billig's 1995 book of the same name and is intended to be understood critically. Today the term is used primarily in academic discussion of identity formation and geopolitics. Examples of banal nationalism include the use of flags in everyday contexts, sporting events, national songs, symbols on money, popular expressions and turns of phrase, patriotic clubs, the use of implied togetherness in the national press, for example, the use of terms such as the prime minister, the weather, our team, and divisions into "domestic" and "international" news. Many of these symbols are most effective because of their constant repetition, and almost subliminal nature. Michael Billig's primary purpose in coining the term was to clearly differentiate everyday, endemic nationalism from extremist variants. He argued that the academic and journalistic focus on extreme nationalists, independence movements, and xenophobes in the 1980s and 1990s obscured the modern strength and the most common strain of contemporary nationalism, by implying that it was a fringe ideology. He noted the almost unspoken assumption of the utmost importance of the nation in political discourse of the time, for example in the calls to protect Kuwait during the 1991 Gulf War, or the Falkland Islands in 1982. He argues that the "hidden" nature of modern nationalism makes it a very powerful ideology, partially because it remains largely unexamined and unchallenged, yet remains the basis for powerful political movements, and most political violence in the world today. However, in earlier times calls to the "nation" were not as important, when religion, monarchy or family might have been invoked more successfully to mobilize action. He also uses the concept to dispute post-modernist claims that the nation-state is in decline, noting particularly the continued hegemonic power of American nationalism.